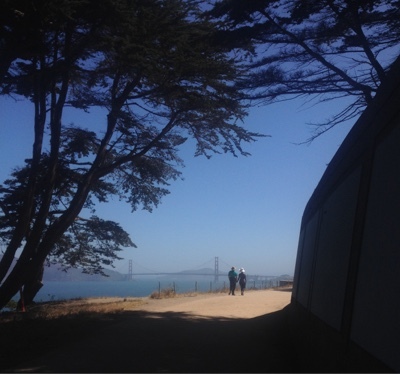 I went to smell the Ocean on Monday morning with my people (I think I mentioned I'm working a 9/80 schedule now). 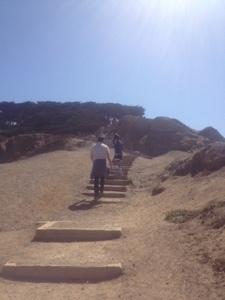 We drove out to the Legion of Honor (where I have threatened to take them back for some more "culture") and walked a loop of Land's End exploring a path or two down to the ruins of the Sutro Baths and bits of beach. 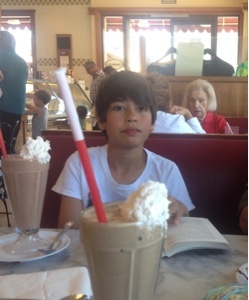 Then after a Dr. appointment out in the East Bay that went well, we all enjoyed some ice cream treats. Ever seen the Pixar movie Up? (It's a tissue box event if I may say) This is the ice cream shop featured at the end, Fenton's. 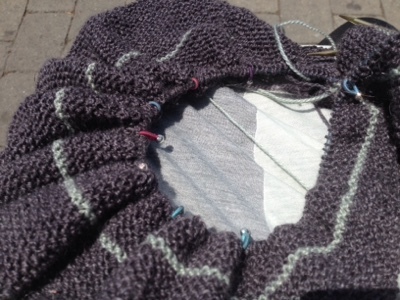 My world of knitting has been 2 steps forward and 2 steps back. No, you read that right. it's called cast on and rip out and ... repeat for more than one project. Laceweight and Mohair. ugh. "What are yarns that make Ellen insane for $800, Alex ..."
Soon this knitting thing will be under control again. I just want to get a few things ... going. Everything seems so slow. All these bags of yarn going no-where fast. I feel like I'm constantly rearranging things. I'm unhappy with my tension or I can't find my stitch markers. How can I never find any stitch markers or row counters when I should have like 3,000 by now?!? How come I don't have a US1 circular needle? Not a US 1.5 but a 1. Not dpns, but a circular. Why am I using an index card with hash marks to track my rows and rounds instead of a real row counter. Where does my stuff go? Ugh. The disorganization. And burn goes my stare to anyone who lives in my homestead that dares make commentary on my storage methods. Just don't. I love you, but don't because it's MY STUFF. My stuff does stuff. I don't have a lot of time to do the stuff I want but it's my stuff. It makes stuff, and the most important thing it makes? It makes me happy. Unicorn Parade: Wandering Cat is a Winner!! Well, well, well! The random number generator pulled a #9 which is our lady, Wandering Cat! Image borrowed shamelessly from her blog. The Unicorn Parade is yours! And you also get to lord the title, "Winner" over all your friends and family for the whole week or as long as you like! So remember when the job gets you down, or the cats have an accident or some arse cuts you off in traffic. You just tuck that middle finger salute away and think, "It's okay, because I'm a winner, and Ellen is throwing a Unicorn parade my way." *Don't be scared, I'm not stalking! 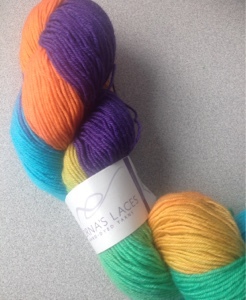 Unicorn Friday: A summer sock yarn giveaway! I'm wishing you all a Unicorn Friday to begin a Magical Weekend. To kick it of I'm ready to gift out a hank of Lorna's Lace, Shepard Sock coming in at nice 430 yards. The colorway is fittingly, "Unicorn Parade". Feel like winning some unicorn love? Just leave me a comment telling me what makes your summer magical and a way to get in touch with you (i.e. Ravelry handle etc.). I'll draw for it next week Tuesday. It once was a weekend. This past weekend was one of wonderful balance. I got some much needed exercise for my body and brain. I cleaned or tidied rather, my apartment to a status less ... frightening. I even managed to put the laundry in it's place. There was a moment there where I thought it was possible the piles would come alive and form a sibling. "Geez Mama, look, it can walk on it's own now!" shudder. We celebrated my father's belated birthday with a fun meal. Lots of good eats and lots of laughter and stories. Just the way we like it. 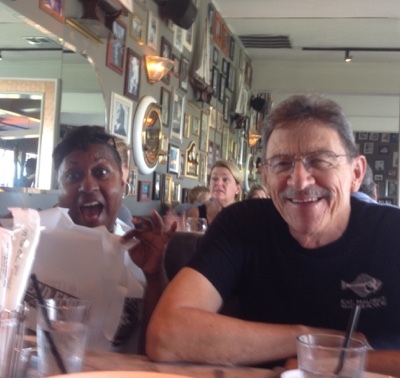 Those crazy kids are my Step-Mom and Dad, cute huh? Sunday a very haggard half mug of coffee me, *FaceTimed with my friend CK who is visiting family in the UK and working on her very first sock. She was struggling to understand the heel construction. She's working on Hermione's Everyday socks. It turns out she was forgetting what ssk meant knitting the 2 slipped stitches together and was making an extra large gap. Well somehow in helping her, I remembered I had another Hermione lounging on needles in a bag. It was my attempt at the pattern using magic loop. And friends and fellow knitters, by good golly, I think I get it. Somehow I have wrapped my brain around making this pattern work for me. It's going along swimmingly. And somehow this is pretty much the only thing I've knit for the past few days. 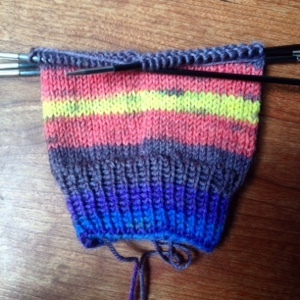 Dare I say it, I see the speed that magic loop allows for sock knitting? I know I'll never give up the old double point needles. I love propping up a sock on a table to admire it in it's spikey 3 or 4 needle glory. However, I do plan on utilizing this method more, after all ... the more socks on the needles, the better. I will have a few cast ons to show, but probably not until the weekend and even then they will still only be slips of pretty color, but that is the joy of knitting isn't it? 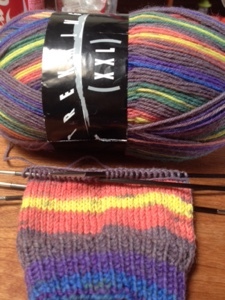 Also later this week, I will have a sock yarn giveaway to celebrate our love of a summer sock knit. Thursday or Friday. Wishing you all well and a happy knit. Katiebee from Life on Coyote Hill Continues shared something with me that blew my mind. When I viewed it I must've done that "Babies and kittens and sunshine farting, rainbow pooping Unicorns, oh my!" sound that brought my concerned cube-mate from around the corner. Katiebee sent me this fabulous link about Mr. Rogers. You all may already know all about this. But his Mom knit his sweaters. In THIS AMAZING VIDEO he tells us boys and girls about it. Concerned cube-mate has brought the DEFCON levels down once I explained, "It's a knitting thing." Finished Objects Friday: Socking it to ya! Spelling out Finished Objects instead of writing FO was just as satisfying as actually completing a few things this past week. I still can't believe how long it took me to pick up sock knitting. Here is my finished pair of Hermione's Everyday socks or as I like to call them, "smart girl socks", cause you know, Hermione is hecka smart in those Harry Potter books and smart girls are what we all strive to be. 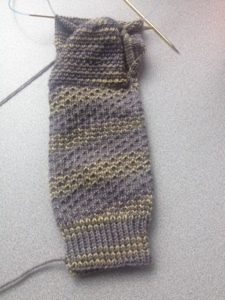 No matter how "easy" a patterned sock is, it takes me a while to wrap my head around it. I have to prep myself, for patterned sock knitting means, thinking knitting and thinking knitting means slow knitting. But I do love the way they turned out. Look at that gusset. Swoon. My name is Ellen and I love a hand knit sock. On a side note, I used my karbonz US1s with Madelinetosh Sock and I think next time I tosh sock on US1 double point needles, I will use wood. I think I need a little more give with this yarn. Don't get me wrong, I love the yarn, but I felt like I had to work more with this specific combination. Next up are a pair of Way Back When socks. These started off as a summer vacation knit ... LAST YEAR. I started working on these in Mexico at the end of last July, early August. I had just finished a shawl and was really tucking into this pair amidst the tropical scenery. Then my vacation was over and I was back in the world of keyboards and double monitors. I must've tucked away my summer vacation dreams until I felt summery again, because I found them in a pile of project bags. I love this colorway. It's "splash" in Felici by Knitpicks, of course. Soft and dreamy and stockinette so it was a quick finish. These socks have a story. Even the boys think it's funny it took me a year to finish them. I managed to finish some socks over the holiday weekend and I openly admit to hoarding them until Friday when I can have a proper Friday FO post, ha! Still feeling contrary about baby knitting I dug around for a bag in a bigger knitting bag (Am I the only one who does this? Nests (potential) projects within projects?) I pulled a lovely ball of yarn and said, "Socks! 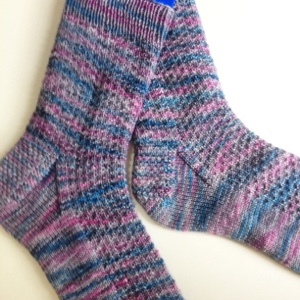 Good old fashioned stockinette socks!" In two evenings (where no gym was involved and an excellent episode of Case Histories) I managed to get about 62 rows in. I'm ready for the heel flap. This is more like 37 rows, but I kept going! But I've stopped. I've picked up the second short row section of the Twinleaf wrap. I think it's a good place to stop and mix up the project knitting, but honestly I think I'm not that in love with the way this yarn or more specifically this colorway is knitting up. I like it. I just don't love it. I think it is browner than I was expecting. I was thinking it would be more lavender/gray, I suppose. Also this little bits of dye that gently pattern the stripes -- I think I'd prefer it without or have it mottled all the way through. I dunno. But looking at the ball and looking at the "stripes" my expectations have been ... surprised. 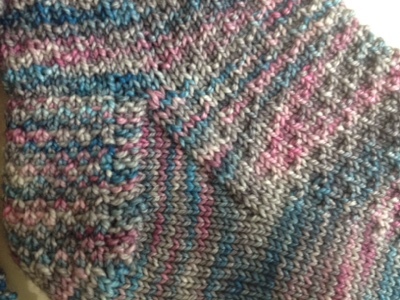 Here is a close-up of the yarn and colorway on the Simply Socks website. It is Trekking XXL. Here is a photo of the ball of yarn next to it knit up. Everything feels more ... muted. It's a bit like July in San Francisco. Even the fireworks come with fog. Anyhow, I am sure I'll be ready to return to them after another section of Twinleaf. I'm working 60 sts on US 1.5s. I think you could go down to US1s, but I think that US 1.5 are my favorite size to knit socks with. After this pair, I have my first pair of socks on magic loop that I need to get back to and maybe then ... I'll be ready for another baby knit. I hope you all had a good 4th of July weekend. I did. I managed to do a whole lot of nothing on the 4th. I went to the gym and they were doing a special holiday schedule and the class I took was 90 minutes long. I was useless the rest of the day. It's okay though, because when the boys went to go watch the fireworks I knit and watched some pretty craptastic cable. First off for the weekend, I tried a new recipe. I have figured out that I'm kind of drawn to variations of the brownie cookie. So when I saw this one, I decided I could fit it into the weekend schedule. I let The Kid and his friend decide on the toppings. Sprinkles always win, but mint chocolate chips and butterscotch were also used and so were an unusual combination of all those things ... hmm. 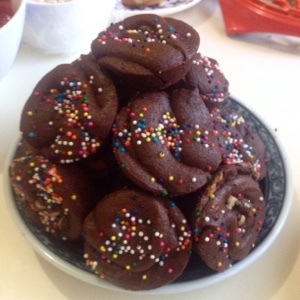 I saw in the comments of the recipe that after filling the wells of the mini muffin pans some bakers piped the remaining batter into circles. This is exactly what I did on parchment paper and I would probably do this again especially if I were going to use this batter for ice cream sandwiches. Ooooo! What are your feelings about potato salad? What's your favorite summer salad? I admit, I had planned on making pesto pasta salad with olives and bell peppers and artichoke hearts but I didn't really do much that day. I sort of acquired the goods, left the recipe out and mentioned this is what I wanted to make. It seemed while I took a shower and a nap (apparently I like naps and potato salads now. Who said your 40s aren't full of new adventures?) 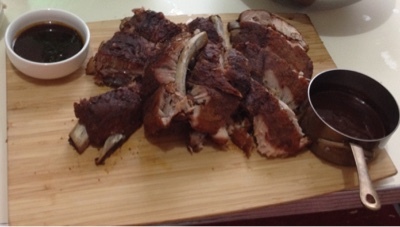 the Manfriend decided to rub the ribs and salad some potatoes. Once I was socially engaged again I sort of consulted with him from my knitting chair as he continued to execute and implement the meal. It was impressive. "I'd" do this again. I'm really grateful that Smitten Kitchen provided various oven temperatures for different times. She's fantastically practical in her way of knowing you think you're going to have plenty of time for "slow and low" and then suddenly it's only a short period of time you have left. We opted to take the foil off the last 10 minutes and crank it to 400 to kind of crisp them up. They weren't crispy crispy, but they were definitely good. 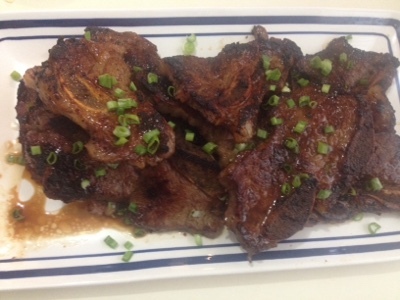 Korean BBQ Shortribs. I know, I know, you're all asking, "But how, Ellen?!? You just told us for the 80th millionth time you don't have a grill! Did you GO OUTSIDE to a park where there is sunlight and people?!?" hahaha, seriously I'm laughing at YOU now, silly Internet! No! We used our handy dandy cast iron skillet. The big one, because that's what the Man Friend wanted for some gift giving occasion last year. It's just store bought marinade, but jazzed up with some cloves of garlic, white onion, and green onion and a little black pepper. When it's time to put them in your skillet, pull all the marinade bits off so they don't burn. Maybe what made this meal taste so ... well, tasty, was that we made it together in the kitchen. I made the stir fried cabbage with a little fish sauce, garlic and white pepper and The Kid helped us make some home made karaage from 2 boneless skinless thighs that had to be cooked. We rounded it out with some more left over veggies and steamed rice. It was a simple meal from a happy kitchen. What did you eat over the weekend? I don't care if you're not American, I assume it was still July 4th everywhere and at some point and you ate, ha! I hope you ate well. And don't forget! Tell me and the rest of our pals about your summer salads! Or maybe just some good old fashioned knitting? I have been rather busy lately personally and professionally and unable to spend time in the blogosphere as I'd like. But rest assured. I'm good, my people are good, I'll be around to visit soon and ... why yes, yes I have been knitting. I took a break from it to finish some baby knitting. Then the plan was to do some more baby knitting, and then literally there were TWO MORE people that I found out are going to have small people. You're killing me, people. Seriously, get some cats, how am I ever going to knit something non "wee-sized" again? Babies are born. Babies are going to keep growing on the inside and getting born and well ... they have to wait because Ellen needs to do some summer knitting that can fit something larger than a potato! Well I'm a rebel (ask my mother, I think she's still recovering from my youth) so I'm working on my shawl. I am doing the EXACT yarn and color combinations as described in the pattern notes. Why? Because I lack imagination and I thought it was pretty. * For some reason I didn't notice in the project notes where people said that it really required 3 hanks of the Main Color. So ... I sent off for another hank of yarn. I haven't really eyeballed how close the dye lots are, because I just can't feel disappointed now. Also it's gray, I'm hoping the dyelots are forgivable. shh! cross your fingers and let me dream! * The gray yarn seems to bleed a little when my paws have been working on it for a bit. Will be interesting to see how the color of this fibre company holds after it's blocking. * I'm almost done with the first short row section after the initial border. It's been fun. I'm already thinking how I'd modify it to make the stripes of contrast color wider a second go and what possible color combinations I would do. * It's gonna be a big baby. I mean huge. In the pattern she says it blooms. Oh dear.